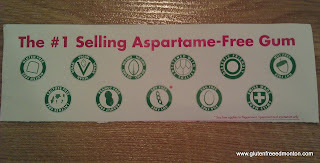 Gluten Free Sugar Free Aspertame Free Gum! Really? Recently I received an intriguing email from Judy James, Public Relations and Communications Coordinator at PÜR Gum Action Candy Company. Judy offered us at Gluten Free Edmonton the opportunity to taste test and review their Gluten Free, Sugar Free, Aspartame Free gum. I admit that I was skeptical to say the least about this product. It wasn't the gluten free part that was so absurd to me, it was the sugar free and aspartame free part that kinda through me for a loop. This gum is gluten free, vegan friendly, contains no GMO's, nut free, sugar free and aspertame free. Judy sent me out a trial package of the 4 flavours available from the PÜR Gum Action Candy Company; Spearmint, Peppermint, Pomegranate mint and their newest flavour Excitemint. PÜR Gum was "established in 2010, PÜR Gum was created as a healthy alternative to commercial varieties of gum that contain aspartame. This all-natural aspartame-free gum is available in Peppermint, Pomegranate mint, Spearmint and ....Excitemint. PÜR Gum is currently available in over 3,000 locations across North America and continues to be a leader in providing sugar-free great tasting gum. Kick aspertame and find PÜR Gum at http://www.purgum.com/ . 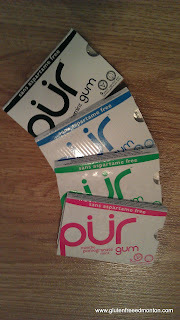 PÜR Gum retails for between $1.49-$1.99"
For anyone who does not know me well, I used to be an avid gum chewer. I recently seriously cut back on my gum chewing mostly because of jaw pain. So when offered a "reason" to chew some gum...I was all for it. I tried each of the 4 flavors and I have to say that my favourite flavour was the Pomegranate Mint. I found it to be unique and interesting and loaded with flavour. For me the Excitemint flavour was simply too strong, but others who tried it really enjoyed this powerful mint flavour. I found that the texture of the gum was a bit tough and that the gum got hard to chew after only a few minutes of chewing. The flavour however, seemed to go on and on and I could see it lasting for a really long time. For those of us who have to deal with the challenges of finding gluten free and diabetic friendly food options, PÜR gum is a true winner. 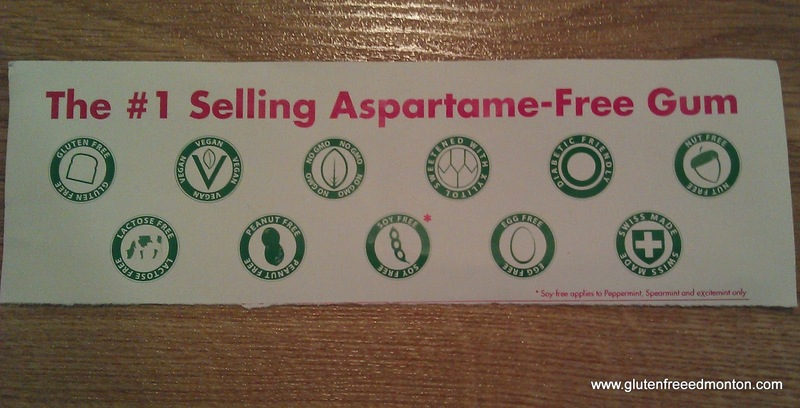 While I do not wish to get into the varied research pro & con for aspartame addition in our foods, I will say that if you're looking to cut out or cut down on the amount of aspartame in your diet PÜR gum offers an opportunity to enjoy flavourful gluten free, aspartame free gum. You may be asking yourself, just as I did, what sweetener ingredients are in this gum if there is no sugar and no aspartame? It turns out that PÜR gum uses xylitol instead as a natural sweetener. According to Wikipedia, "Xylitol is a sugar alcohol sweetener used as a naturally occurring sugar substitute...it is found in the fibers of many fruits and vegetables" such as corn. The carbohydrate content in the PÜR gum is similar to that found in various other brands of sugar free gum; at 2g carbs per 2 pieces. 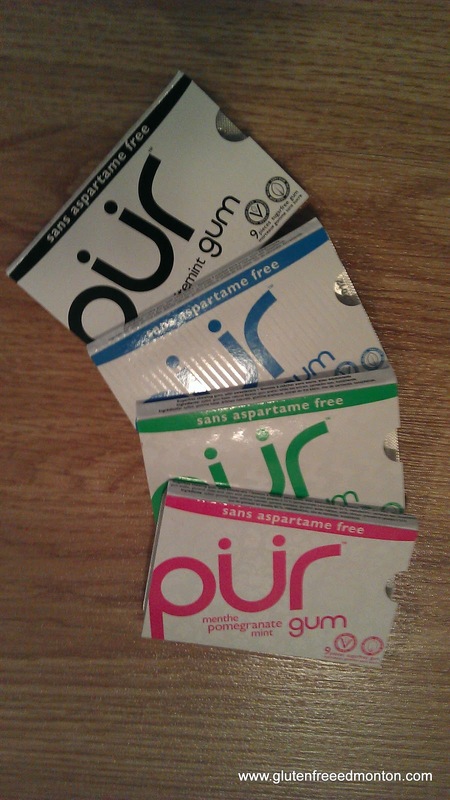 Lastly, check out all the places in the Edmonton area where PÜR gum can be found. I was approached directly by the Action Candy Company to taste test and review my views of their product PUR gum. The gum was provided to me free of charge and I was not paid for my opions by the company. The views above are my own and I was asked to be honest in sharing my views. I can always count on my brother from Haggis and Herring to be looking out for a good gluten free recipe to try. 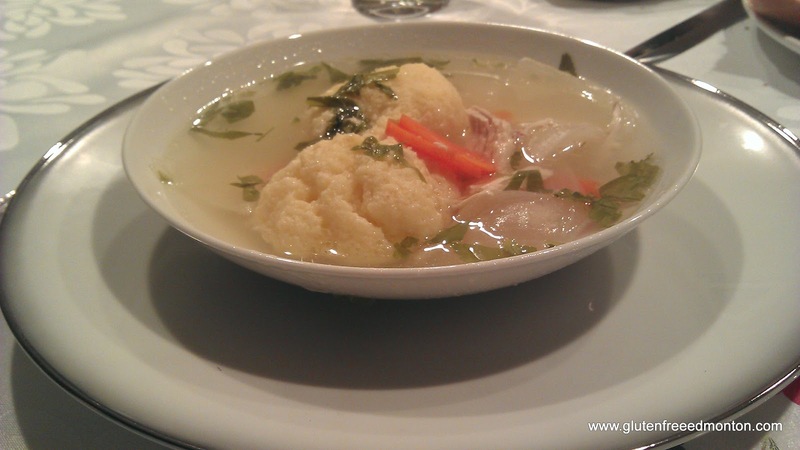 Rosh Hashana is around the corner, and my brother knows that Matzah Balls are a staple at the dinner table during our Jewish New Year. The other day Dan emailed me a recipe to yet another gluten free matzah ball to try. He emailed us one last year with a potato base that tastes awesome. But its just not like the real thing. We didn't end up sharing that recipe but maybe one day we will. In the meantime, I will share this recipe he passed on because it looks great. I sent it to my mother-n-law knowing she is brave enough to try any new gluten free recipe we pass her way. She really does get gluten free cooking and baking! The recipe is from the Gluten Free A-Z Blog. 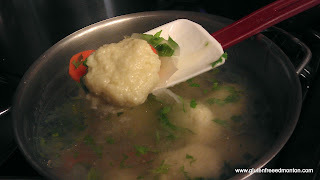 I'll admit, I have never read this blog, but this recipe for gluten free matzah balls looked to good to be true using bread cubes from Glutino. Note, my mother'n'law tried the recipe with Kinnikinnick bread cubes and it didn't work because they were made from rice. Must use Glutino bred cubes found at Planet Organic. ** If you do not have to make them gluten free, substitute regular breadcrumbs or ground matzo meal instead of the gluten free breadcrumbs. In a separate bowl mix bread crumbs and salt. Add wet ingredients to dry ingredients and blend well with fork. Remove batter from refrigerator. Divide batter into just slightly smaller than golf ball size balls ( should make about 8-10 . Reduce to a simmer and cook for 30-40 minutes. Add to warm soup and serve. We checked out the breakfast buffet at the River Cree Casino & Resort recently. For those not familiar with where it is, its located basically at the end of the Whitemud West just outside of Edmonton city limits in Enoch, Alberta. Obviously buffet, is definitely a red light zone for cross contamination with gluten, but its always nice to go to a buffet and have that plethora of choice to eat. The River Cree Casino &amp; Resort is gorgeous and has plenty of eating options. The breakfast buffet is in the hotel restaurant called the Kitchen Buffet Bistro and runs until about 11am. 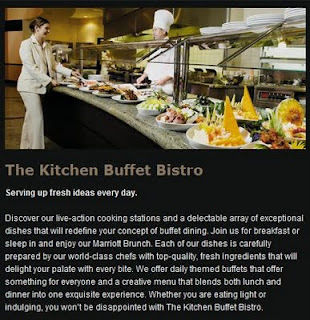 Click here for the complete schedule and pricing of the buffet. So with the breakfast buffet in particular, I don't really have anything bad to say, but I also don't really have anything superfantastic to say. It really was just a standard breakfast spread with fruit, cereals, cold cuts, cheese, bacon, potato, sausage, omlette station, waffles and French toast. Basically everything at the buffet was gluten free except for the cereals, waffles and French toast. For the cost of the buffet, you really didn't get much choice, but atleast there was not much less choice than a person that could eat the whole buffet. The Sunday Brunch with added carving stations, deserts, and salads seemed a lot better, but was also almost $30 a person. I did not stick around to ask what buffet items were gluten free for that buffet, but I was told that if you asked, someone from the kitchen would walk you through the buffet to let you know what items are gluten free and what items are not. Let us know if you have been to the other buffet times at the River Cree. We want to hear about your experience. Looking at the menu they have all their gluten free pizza's clearly marked with a GF in orange. Click here for their nutritional info including gluten free information for people with Celiac Disease. Any of these links broken or images not showing? 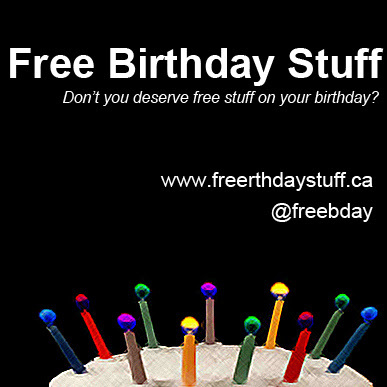 Let us know by emailing us at info@glutenfreeedmonton.com. I know that I’ve written about my frustrations with misconceptions about gluten free living and dietary restrictions before, but really & truly it drives me a little nuts when I am told “oh so and so is gluten free and they’ve lost all this weight”. It bothers me, not because I am jealous that so and so has lost a bunch of weight (although I admit I am a little jealous). It bothers me because I fear that people think of the gluten free diet as being just that “a diet” and not a medical condition that requires significant attention and attention to detail regarding ingredients in foods, cooking preparations and so much more. I feel these views create a lack of seriousness in regards to what we go through and have to do each day. It bothers me to hear that so many people view the gluten free diet as a diet meant to simply lose weight. For some, maybe cutting out gluten does enable them to lose weight and if so good for them. However, please do not belittle my very frustrating dietary restrictions into simply a weight loss program because that is not it at all. I have to be careful when speaking with these people because after all they are never people I consider to be close friends or family members who know me well, know my dietary restrictions (Celiac) and know me as a strong willed, determined, sometimes overly cautious individual. Instead these people think I am just one of many following a fad diet and so-called “making a big deal over nothing”. I have even found that some of these people feel that having to eat gluten free is “no big deal”. Ummm are you kidding me? Seriously? I think it’s a pretty big deal. I think I’d much rather not have to be so careful. I’d much rather be able to simply eat whatever I want whenever I want without direct consequences. I would much rather have my main concerns when going out to a restaurant for dinner be the question of “should I have the pasta or the pizza tonight”. But instead I have so many more things to keep in mind and take into consideration. I need to ask about preparation and contamination, I need to ask about seasoning and spices used; I need to ask questions to ensure the restaurant understands the severity of my dietary needs and knows that I cannot simply assume it is ok for me to eat. There are just so many things we with Celiac must take into consideration before we put any food in our mouths. People just don’t seem to get it and while I do believe that we as a gluten free community are increasing the amount of information available to those people who do not understand, I want to do more. As mentioned in a previous post I came across a couple of wonderful cook books that are filled with entirely gluten free recipes AND all of these recipes are created in the slow cooker. My favorite part of these books was that not only is everything gluten free, but also there are "normal" ingredients in every recipe. Just as I do not like to eat ingredients I cannot pronounce, but I also do not like when I have to run around to a bunch of different stores to find the ingredients I need to make some new recipe. With all the icky rainy weather we've been having lately I just did not feel like spending my time in front of the stove making a mess and making dinner. I wanted to be able to use whatever I had in my cupboard already and make something that tasted wonderful and required limited dishes. I reached for my list of super easy slow cooker recipes from Stephanie O'dea's book titled "Make It Fast, Cook It Slow: The Big Book of Everyday Slow Cooking. What a treat this one turned out to be! Fast, easy and used only a few dishes...my favorite. Use a 4 quart slow cooker. Put the peanut butter into the stoneware and turn the cooker to high to begin the melting. Add soy sauce, sesame oil, garlic, cayenne and ginger. Stir to combine. Add chicken, and toss to coat. Cover and cook on low for 6-8 hours or on high for 4-5 hours. Add water if sauce doesn’t look thin enough to cover the chicken well. Your meal is done when the chicken is cooked through and has reached desired tenderness. The longer you cook it, the more tender it will become, but it may fall off the bone if you cook it too long. If your slow cooker isn’t at least two-thirds full, keep an eye on it so the peanut butter doesn’t burn. You may need to stir it a few times. *I felt that the sauce was too thick, so I added approximately 1 cup of water to thin it out and ensure the larger sized pieces of chicken were full covered to avoid dryness. If you're anything like me you're always super excited to hear of new and different restaurants that provide gluten free options. Recenlty, a friend of mine provided me with yet another new (to me) place for us to try out. Mill Creek Cafe (9562 - 82 Avenue Edmonton) offers both gluten free pizza and gluten free bread. They also have a variety of vegan and vegetarian options available. Their extra charges for gluten free fare are completely reasonable, which is always an added perk. For gluten free pizza there is an extra $1.50 charged and for gluten free bread the extra charge is $0.50 per slice. Compared to some other restaurants that feel they can jack up the price because something is gluten free, I consider these very minimal charges to be very reasonable. Based solely on my friends verbal recommendation I want to check this place out, but when I actually saw her gluten free pizza...wow! It looked and smelled awesome! Of course I wasn't going to just reach over and sample it while she was eating, but it sure was tempting to do so. 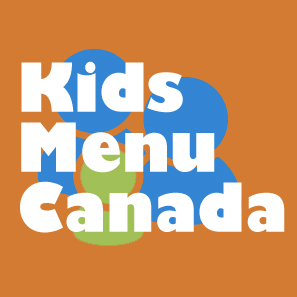 We are always looking for information from you, our loyal gluten free edmonton readers, about different restaurants within Edmonton or on your travels that serve awesome gluten free fare. Please let us know your personal favorites. There are some great events and workshops coming up this fall that the Celiac Association is hosting here in Edmonton. Register by contacting their office at 780-485-2949 or ccaedm@telus.net. If you suspect you might have celiac disease but have not been diagnosed, this session is for you. Learn about the symptoms, associated illnesses and tools to advocate for your health needs. Topics covered include: Eligible medical expenses (for Celiacs), Refundable Medical Expense Supplement, Registered Disability Savings Plans Disability Tax Credits, Disability Support Deduction Caregiver Amounts, Transferring of Non-refundable Tax Credits, Attendant Care of Care in an Establishment, Disability Tax Credit. Pick up our new Medical Expenses Worksheet for Celiacs to assist you in tracking your expenses for re-imbursement through Canada Revenue Agency. Whenever we go to visit family & friends in Toronto one of my favorite places to check out is a wonderful book store called BMV at Yonge & Eglinton. This book store can be found in other areas of the city as well, but this particular location is by far my favorite. Not only is it because that area used to be my 'hood and there are always many fond memories that flood my mind when I walk around the area, but also because this location has the best selection of "my" kinda books. BMV books is a discount book store that sells both new & used books. They carry a very wide variety of books, some newer and some older, but their inventory is constantly changing and that's what I love the most about the store (as opposed to the larger major chain book stores). While in Toronto last month I happened to find two wonderful cookbooks specializing in gluten free options, neither of which I had seen anywhere else AND they were each only $7.99...hello! Bargain shopped extraordinaire Amanda is in heaven! The first book is called Allergy Free Cookbook (no eggs, no dairy, no nuts, no gluten) By Alice Sherwood. This book is full of a variety of different recipes and on the side of each page there are sections explaining how to make each recipe if you require no eggs, no dairy, no nuts, or no gluten. As you can imagine, I was loving this idea. What a great book. That and the fact that the book is not loaded with weird recipes for foods I would likely not ever consider making anyways (hate when that happens). My first crack at this wonderful cookbook was for the Gluten Free Cinnamon, Raisin & Apple Muffins. I used to make muffins all the time in my pre-gluten free days. Sadly I haven't been making them nearly as much lately. This is partially because of the often dense texture associated with gluten free muffins, but also the often high carbohydrate values associated with muffins. To my delight, these muffins were neither dense nor overly high in carbs! I admit, the carb content was not low either, but it was more in the mid-higher range but at least there really wasn't anything unhealthy involved in the muffins (aka cups an cups of sugar or fat). 2) Sift flour, salt, baking powder, and cinnamon into a bowl. 3) Add the remaining ingredients and mix well. You will have a thick wet dough. 4) Spoon into the prepared muffin pan (they should be full). Bake in the oven until risen, pale golden, and firm to the touch, about 20 minutes. 5) Transfer to wire rack to cool. *The muffins keep well for a few days in an airtight container and can also be frozen. Based on the ingredients that I used this time round I calculated that the carbohydrate content per muffin was 24g carbs net. However it is important to note that depending on the size of the apples you use this could vary significantly from one batch to the next. 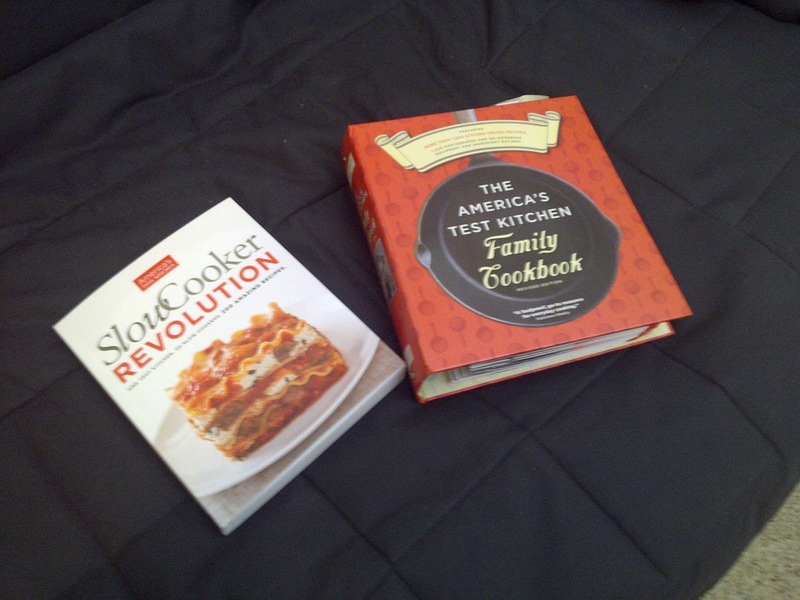 We often talk about the America's Test Kitchen Family Cookbook which we love. We found another version from the America's Test Kitchen team specifically for slow cookers and we think we hit another gold mine for easily adaptable recipes. The book is called America's Test Kitchen Slow Cooker Revolution. Amanda's mom introduced us to the America's Test Kitchen Family Cookbook pre-Celiac. In general this is a great cookbook. A lot of the recipes are easily adaptable to be gluten free recipes, and most are naturally gluten free which always makes things easier. When ever they ask for flour, we simply substitute with Bob's Red Mill All Purpose Gluten Free Flour. But we are certain you can use any gluten free flour blend you have in your pantry. What's great about these books is that the instructions are laid out clearly so anyone can prepare the recipe. Not only are the instructions clear, but they have pictures, not just of the final products, but preparation methods as well. As well part of America's Test Kitchen's recipe writing process is finding out the best way to prepare an item. They talk about several ways they try to prep an item, and show you the best way, and often with pictures. Often in a recipe it will tell you to turn to a different page to show you how to prepare a certain item. As an example, for our Gluten Free Buffalo Chicken Fingers, they go through the proven and most effective way of coating the chicken that works so well for this recipes and others. We recently purchased the Slow Cooker Revolution cookbook, and although we have only tried one recipe so far, we were not disappointed. All of this, simply reaffirms the usefulness of the America's Test Kitchen series. As you all know, I have said many times before that I have serious blog reading addiction. We were recently away and therefore I got seriously behind on my blog reading, thus forcing me (I used that term super lightly of course) to read thru a ton of wonderful blogs and smile all the way through. I know I know, poor poor me. I wanted to share a link to one of my favourite bloggers Kerri from sixuntilme.com not only because I so enjoy reading about her diabetes related insights and shennanigans, and she always seems to make me feel less like the only person out there living with diabetes, but also because she sometimes writes about gluten free living and gluten free food options. 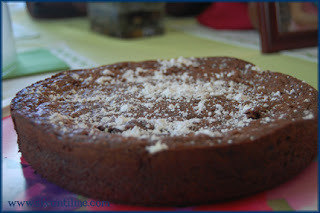 Today is no different (well she posted it on August 30) check out this super easy sounding Gluten Free flourless chocolate cake with Nutella mmm just the name makes my mouth water and my insulin pump go crazy with uncertainty. Enjoy! Happy Friday Everyone & have a great long weekend!